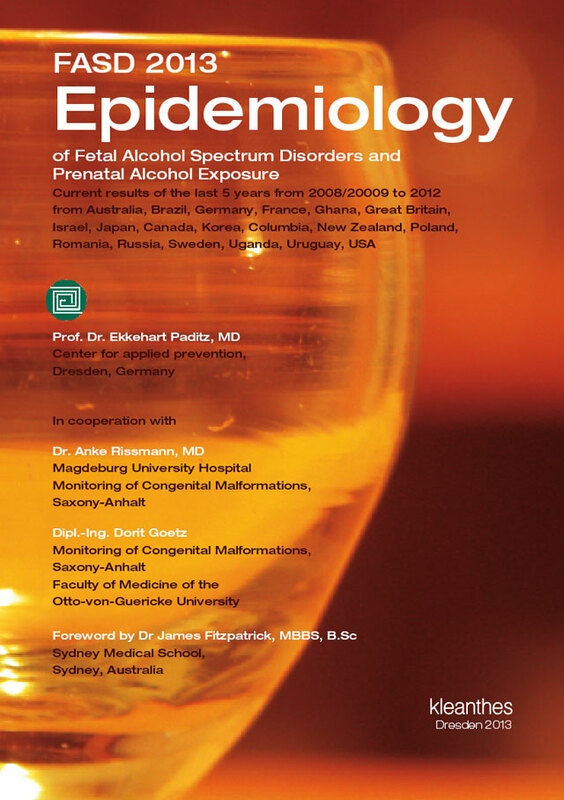 Current analysis of FASD epidemiology and the prevalence of maternal alcohol consumption during pregnancy in the last five years from 2008/2009 to 2012 show from an active case search that in elementary schools, at least one child with FASD per class (1:21–25) must be expected (Italy, MAY 2011; Croatia, PETKOVIC 2010). Population-based studies on the state or federal level reveal a significantly lower frequency (Germany, Paditz 2012; Saxony-Anhalt/Deutschland, GOETZ & RISSMANN 2012 in this volume; Israel, Senecky 2009). Several indicators, such as maternal alcohol consumption in 14% of women from Israel, indicate that the real rate of incidence is higher. The range of incidence of prenatal alcohol exposure is found in national, cross-regional, or multicenter surveys of between 2.5% in Canada and 54% in Russia (PubMed 949 studies 2008–2012, including 21 studies from 13 countries with such surveys). Mono-centric studies showed similar rates of incidence between 6–29.5% (results from seven countries). Ulcerosa. Alcoholism and smoking increased this risk “only” five or twofold, respectively (THAN & JOHNSON 2010). (DOUZGOU 2012). Subtle clinical observations offered similar results in 1957 and 1968 in France in FAS first accounts from ROQUETTE and LEMOINE; also likely, set against the background of France in the 50s and 60s of the 20th century, France exhibited the highest alcohol consumption world-wide, as well as that, in this period, the incidence of congenital syphilis in numerous countries declined significantly. This volume is intended for physicians, nurses and caretakers, midwives, psychologists, and key persons working in health and education policy, as well as all other interested parties who deals with the subject of FASD and maternal alcohol consumption during pregnancy. (Italy, MAY 2011; Croatia, PETKOVIC 2010). indicate that the real rate of incidence is higher.